2 of 4 In a large bowl, beat the butter, sugars, peanut butter and vanilla until smooth. 3 of 4 In a second bowl, whisk together flour, oats and salt. On low speed, beat flour mixture into butter mixture until just combined. Press dough into prepared pan. Evenly sprinkle chocolate chips over the top. 4 of 4 Bake at 350 degrees for 20 minutes. Remove from oven. 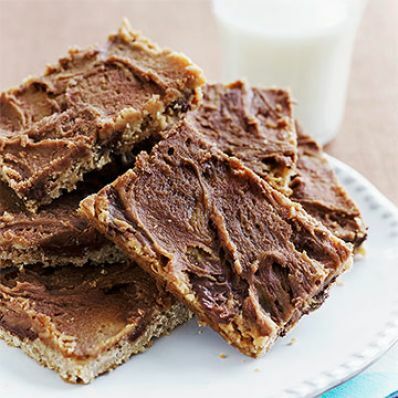 1 of 1 In a medium-size bowl, blend confectioners sugar, peanut butter and milk until smooth. Pour icing over the uncut bars while still warm and swirl chips with icing. Cool completely in pan and cut into 16 bars.